When I first began blogging, I had intended to write more about home decor, as it’s always been an interest of mine. I’d even asked Irene, the artist who created the Sweetopia banner, to somehow incorporate it in the illustration. A quick glance to the top right, and you can see how she represented it with a cute end table and lamp. Fitting, for today, I think, as I’m sharing this gorgeous Decanter lamp, from my lovely sponsor, Uptown Simple. You can imagine my glee, when I was asked to choose an item from the site, and you can also probably imagine how tough it was to narrow the choices down! There are so many beautiful items – click here to see for yourself, and happy news – with coupon code SWEET, there’s free shipping any order over $50.00! 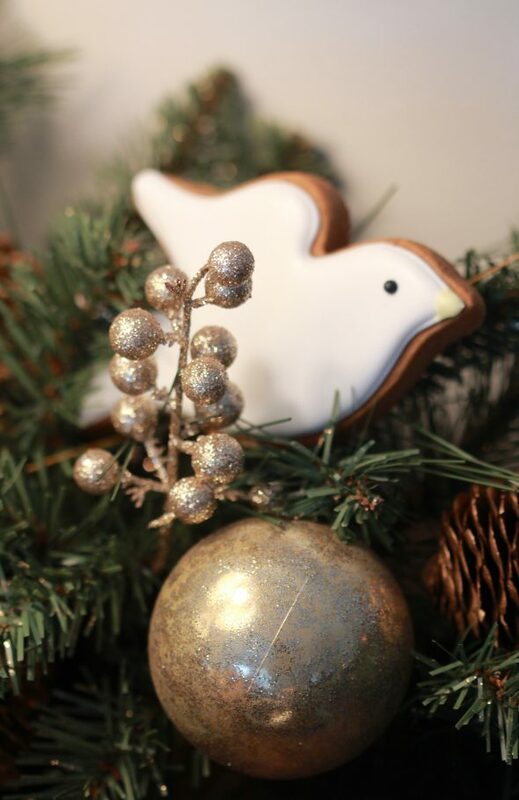 To add some holiday festivity to my side table, I added some garland from Pier 1 Imports, some matching ornaments, and made a few simple dove cookies. If you’re new to cookie decorating, or simply don’t have a ton of time to spend on detailed cookies, these easy cookies are for you. You can click on a quick Instagram video, above, to see how I began outlining these doves, and for other piping and flooding basics, as well as recipes, I’ve included links for you below. My tutorial section (at the top of the site), videos, and FAQ section, also have answers to lots of cookie decorating questions. 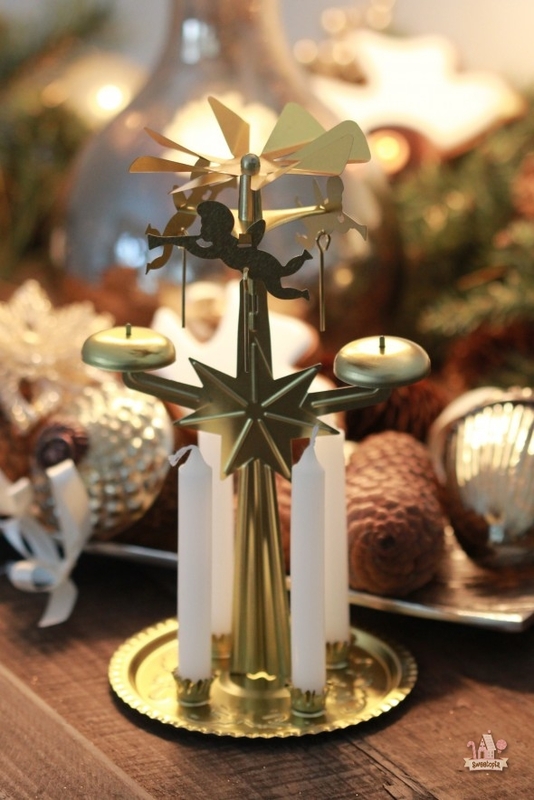 Do you remember these Yule Chimes?! We had one at home growing up… I was just thinking of it the other day and wondering if I’d ever be able to find them again, when I came across them on Piper Classics! 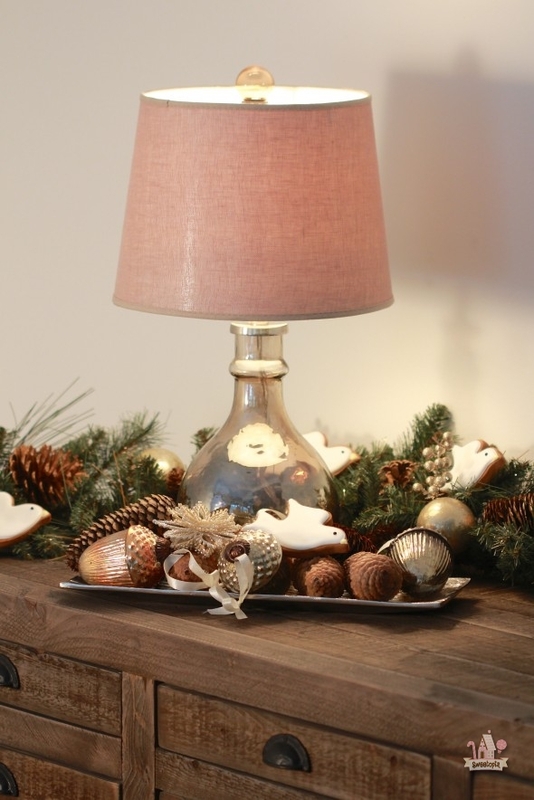 The talented folks from Uptown Simple also own the site, Piper Classics, a home decor site with all sorts of charming items – everything from kitchen items, seasonal decor to furniture and curtains. It’s where I found my glass cloche to go over my gingerbread house. Such a perfect way to keep the house fresh while on display! (My gingerbread house was still drying in this photo, so I didn’t have the cloche over it yet). The cloche is made of such a thick glass and is a beautiful shape – I know I’m going to using it with many of my cake stands for all my sweets! (More on the gingerbread house in another upcoming post). 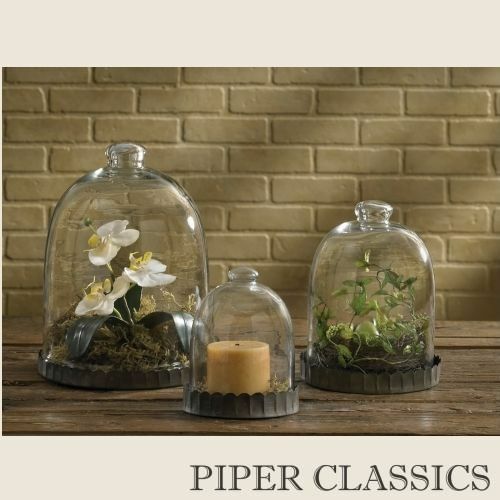 More happy news for you – with coupon code SWEET, there’s free shipping any order over $50.00, on Piper Classics too! p.s. I did receive the items mentioned in the post from Uptown Simple and Piper Classics, but all opinions are my own. Oh my goodness, that gingerbread house is so sweet. You have so much talent. Thank you for sharing it with the rest of the world. 🙂 Thanks so much for your sweet comments! I love the lamp Marion! I would love to get a couple of these. I love home décor as well, I’m very interested in it. I was following your kitchen re-do but have never seen the completed reno. Are you done? Have you posted it yet somewhere that I missed? My wonderful husband just helped me to redo my sewing room. (16′ x 17.5′)You will remember that we have a B&B in an old house, and our house was to be torn down when we bought it. There had been a fire and then it sat for 5 years and leaked and rotted. We have redone this beautiful old girl and the sewing room was the last room to address. (In 1864, it was intended as the dining room but we have repurposed it.) We started almost 20 years ago, and now I am thinking about a new kitchen! That is why I was so interested in yours. I have my fruitcake in the oven this morning, and can’t wait until I get my sewing room put back together so I can try out some new cookie cutters I bought in Halifax last week. I can feel my Christmas spirit swelling! Happy days from Yarmouth, Nova Scotia! I’m glad you love the lamp too! I’ll bet they’d look lovely in your bed and breakfast! I hope one day to see your place in person… I’ll bet your decor is so charming! I would love to see your sewing room, too! I didn’t know you had that talent as well. 🙂 I’ll bet your house is soo beautiful (1864! Wow!). I love those houses, they have such character. Keep me updated with your kitchen… I’ll bet you have high ceilings… one thing I do wish I could change about mine. Merry, merry Christmas to you and your family! Wishing you a wonderful, wonderful holiday and new year! 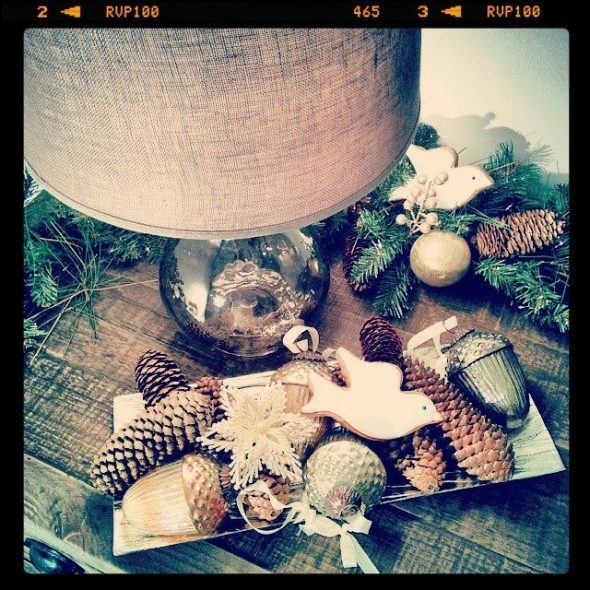 beautiful decorations and lamp,love it! 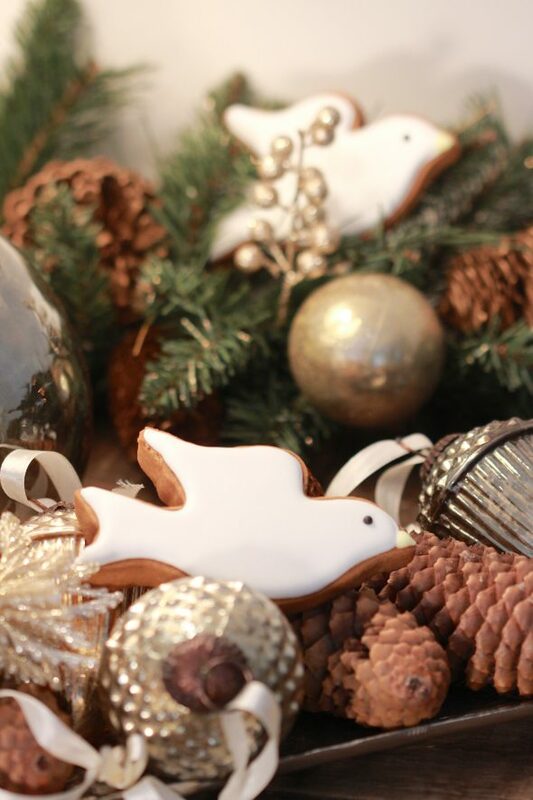 Your dove cookies are a gorgeos inspiration. And that gingerbread house…wow. I can’t wait to see more of it! Thank you so much, have a great day too, Maria Theresia! I saw these on your Instagram this morning:) So fun! 🙂 I need more time to look at my Instagram feed! Caleb is such a cutie in your pics! I have been looking for the Yule chimes forever!! My mother had one and I don’t know what became of it. I am ordering today. Thank you so much. These are so delicate, sweet & beautiful! The cookies are beautiful and I love their stuff!!! Love your gingerbread house and dove cookie. I’ve been wanting glass cloches for some time now. but, thinking of shipping charges to my country (which is > thrice as the original price) . . .sigh! These are adorable and SO perfectly filled! these are just lovely and so sweet and Christmasy! I am curious too, did you complete the remodeling on your home? Would love to see your pictures if you did. Our oven door just broke while cooking dinner. It would explain why my sugar cookies spread during the cooking process, uneven heating. The good news is that the part was inexpensive the bad news is that labor costs an arm and a leg. Thanks for asking! No, we are stiiiiillll not done the renovations… I can’t wait to be finished and to share! Thanks for following along. 🙂 I hope you’re enjoying your new oven! Hello! Love the gingerbread house, is there a tutorial for it? I need a cloche!! And your gingerbread house is PERFECTION. More photos please! 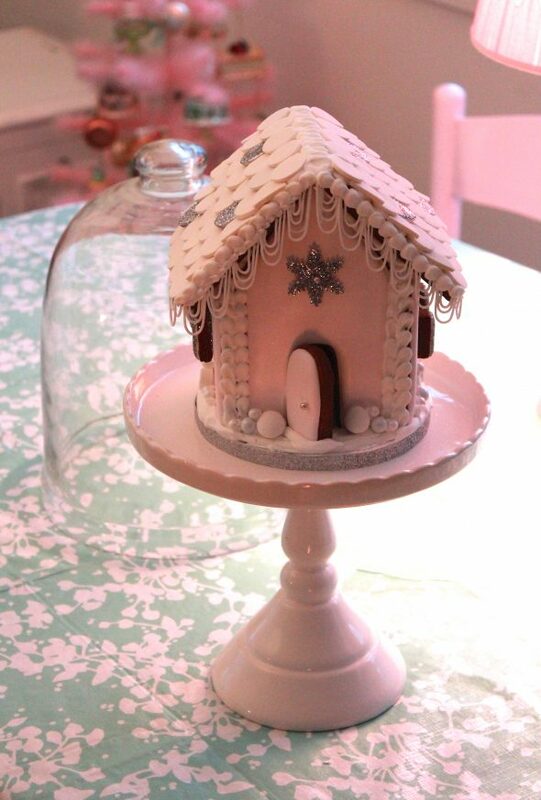 and HOW BEAUTIFUL is that gingerbread house? I love your gingerbread houses, I have been watching your video on youtube quite a few times, it is just so amazing to see how it comes all together. Thanks so much for your post, it brightened my day. Oh girl, I want to live at your house around the holidays. Everything is edible!! And I’d love to be at yours… the meals you make are amazing! I love this cookie! 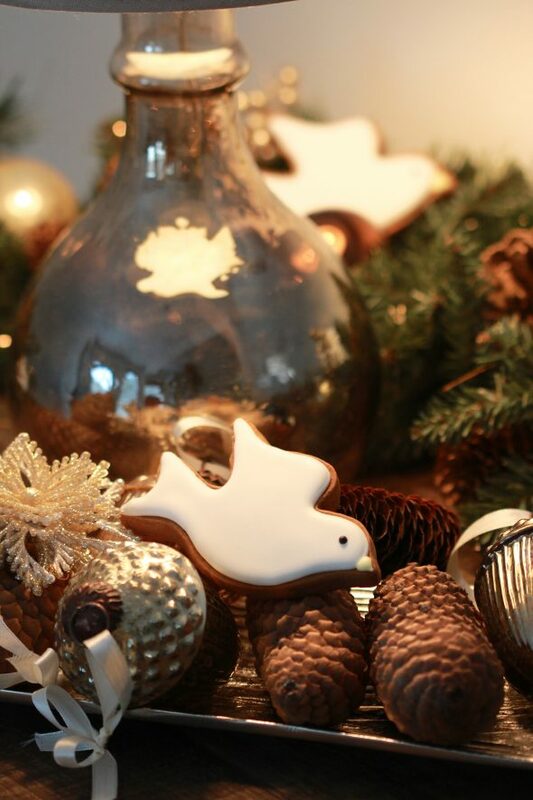 I happened across your FB page today and saw the picture of the dove cookie. My five year old daughter brought home a dove cookie cutter today from bible study. I showed her this picture…she is so excited to make them!